Do you make jerky that you think out-rivals the store bought variety? It’s back! We’re talking about the Second Annual Jerky Contest which, like the event last year, is a World Class Jerky Competition. This year the contest has been revamped and simplified. Instead of having multiple categories we will be doing a winner-take-all contest. Weather it’s hot or mild we will be combining all types of jerky into one category. Many of you had questions about the entrants last year, so with this go-around the judges will better document and photograph the jerkys entered along with a mini review. What types of meat can be used? Beef, pork, venison, goose, turkey, chicken and fish. If you want to step up and prove your jerky is the best around then you need to enter! A $20 fee will be charged for every entry with all money to be reserved for the competition. You can enter as many times you wish. All entry fees will be paid through PayPal. A jerky entry must be in a sealed pouch with the contestant # (to be given out after payment is received) clearly written on the pouch. The judges to be selected will know nothing more about the jerky than what their eyes, nose and taste buds tell them. 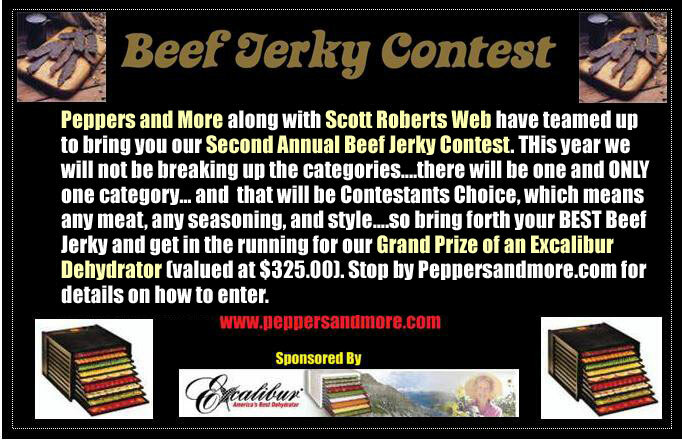 It will be the sole responsibility of the contestant to mail the jerky to the judges. All judges are on the top of their game when it comes to jerky. All participants will be required to send one bag of jerky to each of our 2 judges. All bags should have two nice sized pieces of jerky. If you want to send more, that’s up to you. After you have paid your registration fee you will be e-mailed the addresses of our judges. Visit PeppersandMore.com for further details. To register, please e-mail Doug from Peppers and More at [email protected]. The deadline to enter is April 30, 2011.